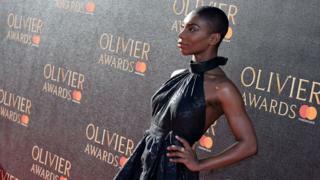 Michaela Coel says she was mistaken for being a member of cabin crew by a passenger on a Virgin Atlantic flight. She tweeted that a woman asked her to "clean up her mess and increase the flight temp". The Chewing Gum actress pointed out she was wearing a black T-shirt while Virgin cabin crew wear red suits. Some fans suggested the reason she was mistaken for a staff member was because of her race. Some fans tweeted their disappointment at the incident - suggesting it happened because the actress is black. This isn't the first time Michaela has had an issue while travelling with Virgin Atlantic. Writing in Vogue in January, the Black Mirror star described an incident while she was in the queue for the upper class section. She said a white woman sped past her and two black men before turning round and joining the back of the line. "What happened? Did three black people signify a queue she usually walks to the right of?" she wrote. "To suggest things may be going on in our brains that we aren't fully conscious of, that we unknowingly make classist, sexist and racist presumptions… well, there just aren't many comfortable ways to take that." Newsbeat has contacted Michaela and Virgin Atlantic for a comment.